According to Keats, September is the season of “Mists and mellow fruitfulness”. Not here in the Axarquia though, where we small farmers dream every night of mists and mellowness. Any time of year will do. Now in September we are experiencing the worst drought in 150 years and the hills, usually green all through the year are starting to fade under the blistering sun. Of all the mixed fruit of the little hill farms, almonds have suffered the worst. Many almond orchards are dead or dying. Muscatel grape, the absolute cash staple and icon of the region, has this year produced only half its expected crop. Thirsty avocados are wilting, the citrus is crisping and curling and it’s touch and go for any baby fruit tree that hasn’t, so to speak, got its feet under the table. 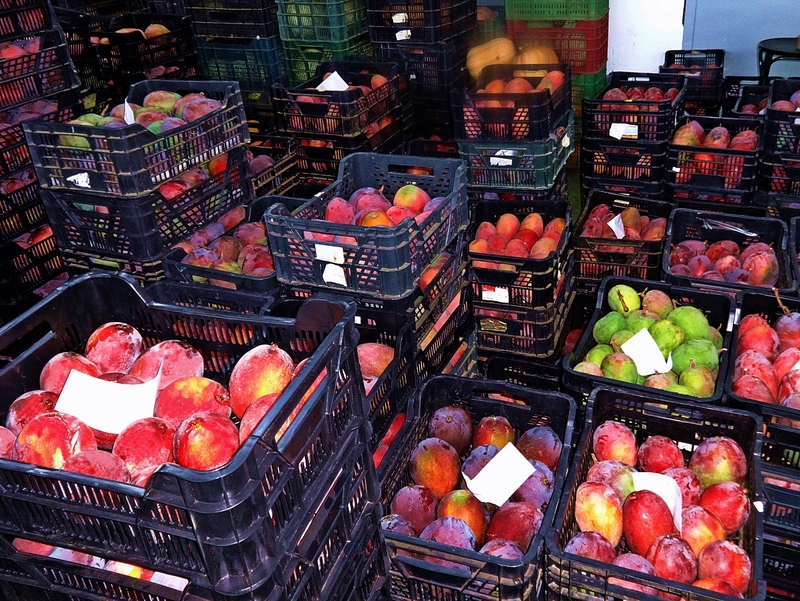 Mangoes on the other hand, contemptuous of the weather, have produced record crops, three times the weight of last year’s, now tipping 20,000 tonnes, with an expected total of 25,000 tonnes by the time the late varieties have been gathered at the end of October. Our little parcela of mixed fruit includes a couple of dozen mango trees and we are presently harvesting and taking them to market. They are our only cash crop. We have a Kangoo van (of course) that takes about twenty five standard mango crates, so we can get about 150 kilos of fruit at a time to market. We would normally have sold them at the co-operative in Trapiche, but it has mysteriously closed down and the nearest now is at Algorrobo. So this year we decided to market our little crop commercially, at the “Mercado Mayorista” in Velez-Malaga. We usually cut our mangoes in the evening when the sun goes down. We try to take the best and biggest first to offer consistent quality and hope that the whole “lot” will make a premium price at auction. You have to cut mangoes with three or four centimetres of stem on them so that burning sap from the cut doesn’t squirt into your eye or over the fruit, lowering its value. Mangoes are like pears – wonderful on their day but like wood if not ripe enough and rotten tasting if overripe. So you have to cut them when green and let them ripen together in their crate. The fruit needs a good week of ripening time left in it if the greengrocer is to show off the fruit in very best condition and ready to eat. We cut fruit Sunday evening and set off first thing on the Monday for the Mayorista, rattling past serried ranks of baby mangoes that now cover the hills. In the winter these babies are wrapped in fleece because frost kills mangoes.That’s why the southern Axarquia is the only tiny part of Europe where it’s possible to grow mangoes commercially. God help the rural economy if we get a frost! In the summer baby mangoes each wear a smart green plastic sock to stop the sun roasting their little trunks. A hill of baby mangoes in their winter fleece. The Mayorista market consists of a massive warehouse with a cafe/bar on one end. Driving in from the direction of lake Vinuela it is unmistakable with its huge car park and great freight lorries. Surrounding it are smaller warehouses that supply all needs from those of agribusiness to those of ex patriot garden lawns. When we came here ten years ago, we thought that “mayorista” meant “elderly”. Of course “Mayorista” also means wholesale and this market is where the greatest as well as the tiniest farmers (us) bring their produce to have it auctioned. 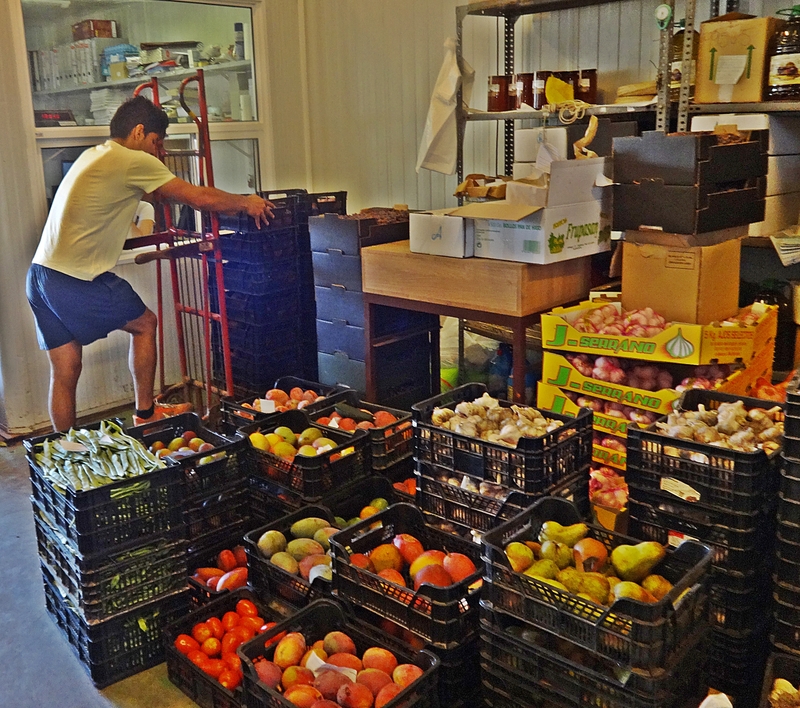 At this time of year the warehouse is a harvest festival of produce – you can find chestnut, cherimoya, mango, raisins, runner beans, almonds, melon, tomato, peppers, and so on and so on. The gateways are filled with small retailers and grocers filling their vans with the week’s stock of fruit and veg, while great articulated lorries at the other end are loading tons of produce to heave around the world. But this market is not just for wholesale buyers. You can buy as little as a single crate here, so anyone planning a vegetarian fiesta or any sort of fiesta would do well to drop by. Drop by anyway, the mercado is well worth a visit and browsers are tolerated so long as they don’t get them selves run over by farmers, barrow boys and hall porters weighing and stacking the fruit. The” Atencia Brothers” are the Mayorista agents for mangoes. I enter the reception/weighing post. There are two administrative staff. The most important is a man who bears a moustache consistent with his authority. He does nothing but clap people on the back, shake hands with farmers and look sceptically at the fruit. His assistant, a young woman, is run off her feet. I wait in the queue until there is literally no one left. She throws me a venomous look.“Dime”. I blotted my copybook last week when signing for my mango crates. You have to sign on a triplicate pad, and of course when I got the bottom copy, it had no marks on it at all. I showed it to her, remarking in what I thought was a light-hearted and charming manner, that I hadn’t seen carbon paper used in business since 1984. She was not amused. She remembers me. “Cuanto?” I am at a loss. How many? “Twenty five” I reply in my finest Castilian Spanish. “Twenty five mangoes?” she sneers, the hint of a grin playing on her thin lips. “Crates” I say. “YES. HHHHHOW MENY?” She tosses me the gob of atrocious English, spoken slowly and loudly, reminding me of a London bus conductor of the 1950’s addressing an Asian immigrant. “You mean the weight?” I say. “I don’t know what they weigh. You’re supposed to weigh them.” I say, indicating the huge weigh plate next to her. She looks past me, gesturing exasperation to the amused farmers gathering in the background. It transpires that I am supposed to guess the weight of my fruit. She then has it weighed and dispels my fantasy of what I think I have produced. She then writes down the actual weight in triplicate using carbon paper, giving me the bottom copy. Again it has no marks on it, so she writes the weight in very large numbers, so that my feeble foreign brain can grasp it. A hundred and forty-three kilos. They take 14%. I shall be lucky to clear 50€ for the lot. Pay day is in November. They require my NIE number for tax purposes. 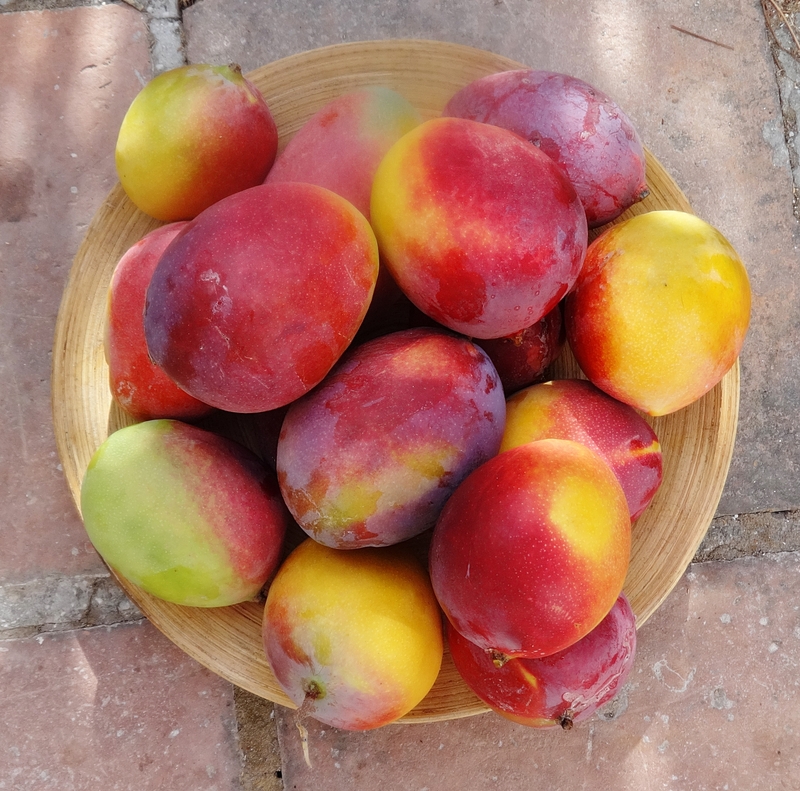 When Maria and Antonio, our neighbours sold us our parcela of sub tropical fruit trees, they told us that they were the very first farmers in the Axarquia to grow mangoes. Well they would, wouldn’t they? In those days apparently you couldn’t market them – the wholesalers didn’t care for new-fangled ideas, so Antonio had to sell them from a van direct to restaurants and hotels for “enormous” amounts of money. It’s very different today. Five years ago farmers tipped their lemon crop into the Rio Velez saying it was cheaper to do that than to take them to market. 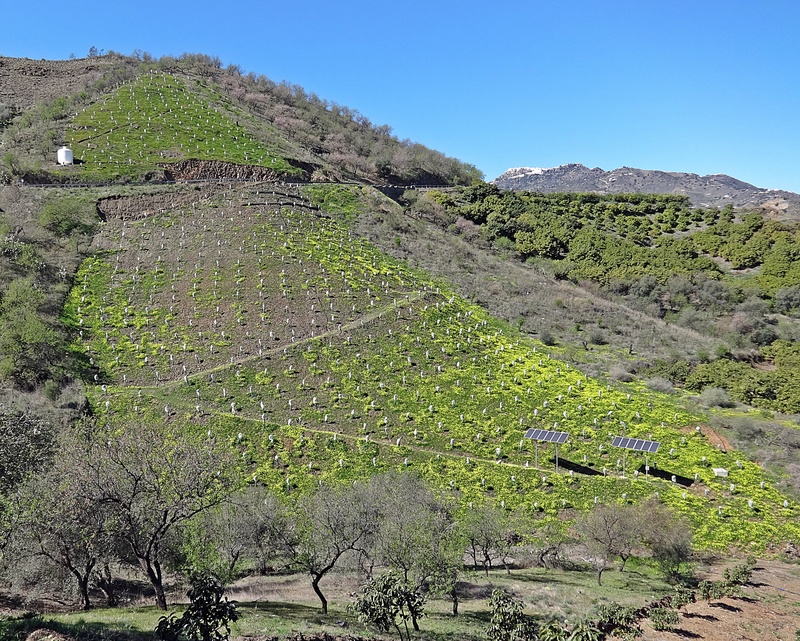 Oranges and lemons were coming in from Morocco, Valencia was undercutting the Axarquia so farmers pulled up and burned their citrus groves and planted mangoes instead. Today grape farmers say that it takes as much work to produce a muscatel pasa (raisin) as it does to produce a mango. A raisin weighs next to nothing whereas a mango weighs a kilo. So where they can, they are ploughing up the grape and planting mango. Avocados need water now, just when there isn’t any but once a mango tree is established it can swell and set fruit even in times of drought. Obviously, where the avocado is dying, plant mangoes. Same with almonds. So this landscape of sub tropical mixed fruit is losing almost by the month the extreme beauty of its cultivated hills. The huge range of produce, the mixture of shape colour shade and texture is giving way to a vast uniform army of mangoes with their serried ranks of glossy palmate evergreen leaves. As the fruit floods and overwhelms the market the price it fetches of course, plummets. Farmers are very conservative and reluctant to take an innovative step unless it feels safe, but once their neighbour makes a profit, everyone jumps on the bandwagon. Fashion in mangoes also changes as the competition hots up. Ten years ago our “Tommies” were the tops, but last years the Mayorista only wanted “Osteen”. Any fruit farmer will tell you that you can’t change your fruit trees like your underwear. It takes five years to rear a tree from sapling to fruit-bearing . And the price per kilo! Two years ago we got eighty cents per kilo for our best mangoes. This year we will be lucky to get fifty. Fifty cents? I’m going fishing for tourists. They are the best crop I know! Thanks for your suggestions. I also grow lemons and many people suggest I make lemon curd. But you only use 2 lemons for a pound of curd. Is life really that long? I’d rather be down the beach with a huge dish of Mora (black mulberry) ice cream or sorbet, which the Spanish make much better than I ever could. Never tried mango ice cream. Just loved your article in this month’s “Market Place” (as above) . Found it both interesting and amusing. Now that I have found your website, I will be a regular reader. I have just one question. We too have some Mango trees that were planted by the builder when he built our house in the campo 10 years ago. 2 years ago we had our first decent harvest and took them to a co-operative. We provided NIE, etc. etc and declared the money received, on the following years tax form. Not a problem at all. Last year, the harvest was way down, and not enough to take to the co-operative. We made lots of chutney and marmalade and gave lots away to friends! This year has produced a wonderful harvest and we crated them up and took them to the co-operative. There apparently is a new law with effect from January 2014. You need to complete a form from Hacienda (Modelo 037) before any co-operative or wholesaler can buy them in. The form is required even if you only take one crate! It has obviously come about to try to stop the black market, but for “hobby” gardeners like myself, it seems a bit over the top. It has cost me money to have my gestor complete and submit the form and he is not yet sure, if we will have to de-register and then re-register next year!! The amount received next month, will go on next year’s tax return…….not a problem at all, but my question is………did the Mayorista in Velez ask you for your Modelo 037 details?….Your article in Market Place, just said that they needed your N.I.E. number and didn’t mention this new requirement ….. Just curious to know if you have any info on this subject. Many thanks for your prompt response. Much appreciated. Modelo 037 seems to be the main topic of conversation in our village at the moment, with everyone (Spanish pensioners) shaking their heads and throwing their hands in the air. We are waiting on more info from our gestor at the moment as to what (if any) implications there are. We only do a one off each year, and it is certainly not for the income it generates.We just love doing it. Our concern is that Hacienda will consider us to be running a business, which we are most certainly not, and that will bring the need for Social contributions etc. etc. etc. Just wish I had read your story in Market Place last week, and then we could have tried the Mayorista instead of the coop which we used in Velez. Thanks again. I will let you know if we get any more helpful info. Well here in Cutar we haven’t heard of modelo37, at least no one who talks to me has. Of course it has been a great year for mangos and its bad luck to discuss success so there has been a roaring silence. Now grape or almonds which have been terrible this year – everyone wants to tell you how badly they’ve done. Here we are the poorest village in the poorest part (the Axarquia) of the poorest province, Andalucia, of Spain. At least for tax purposes. Why are you employing a gestor to fill in a form? The boxes to tick, on the multi, multi pages form, were rather ambiguous, and despite our reasonable understanding of Spanish, we needed answers from Hacienda. Our Gestor also needed answers. We therefore considered it to be well worth the cost of him having a 1 to 1 meeting at Hacienda on our behalf.